"The lines are crisp, the designs are bold, they'll still look dope even as they get old!" 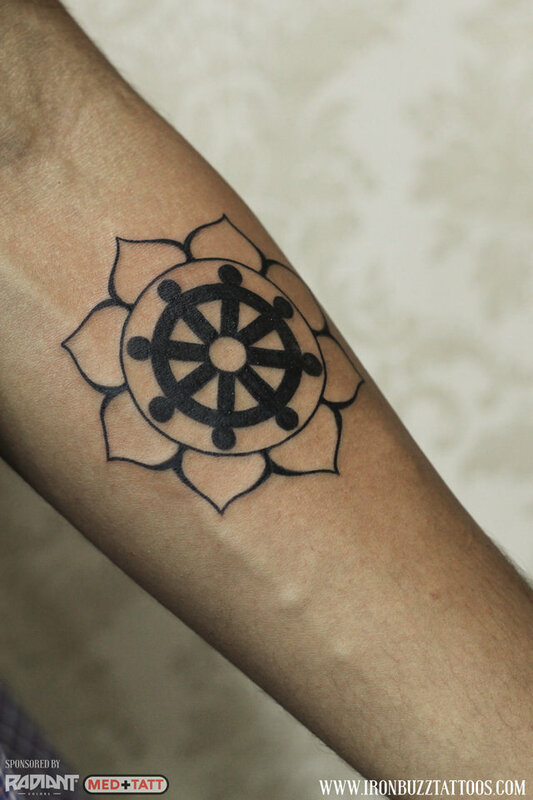 Jayesh is a full-time tattoo artist at Iron Buzz Tattoos, Mumbai and has been trained by Eric Jason D'souza. 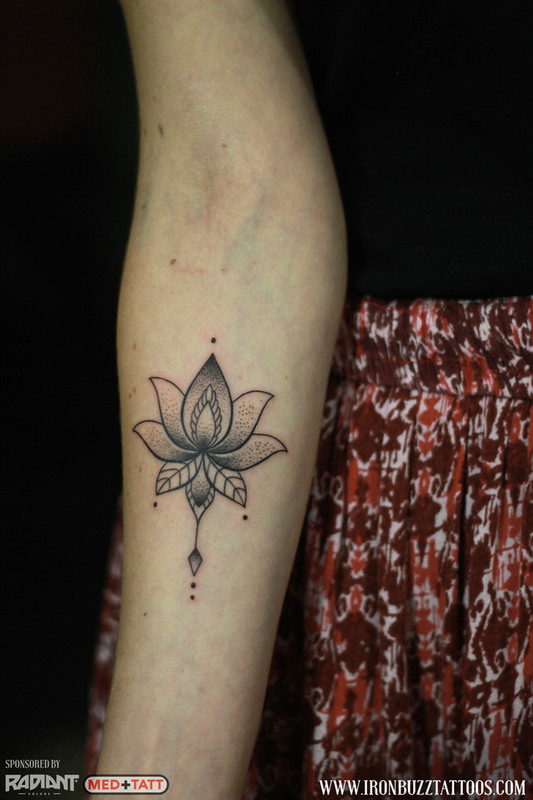 Jayesh specialises in styles from executing intricate Mandala and Mehndi style tattoos to clean minimalistic outlines. He aces these styles of inking while keeping in mind the techniques associated with these diverse works of art. Tattooing straight lines and organised dots is no simple task to achieve on a human body — one needs a strikingly steady hand and keenness to significantly consider pulling off this style — yet once you see these tattoos by Jayesh, it will be obvious that he has invested a lot of time perfecting this elaborate dotism and lineart style of tattooing. Perfect circles and the symmetry in this Lotus inspired Buddhist Dharmachakra is just mind-blowing. 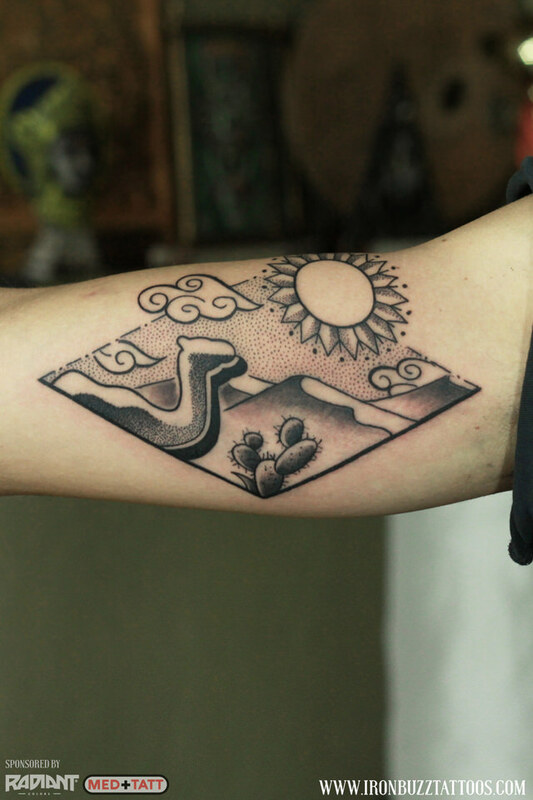 That neatness in this desert inspired tattoo! GOSH! Don't you want to get one? Clean outlines and perfectly placed dots makes us want to get this calligraphic OM too. 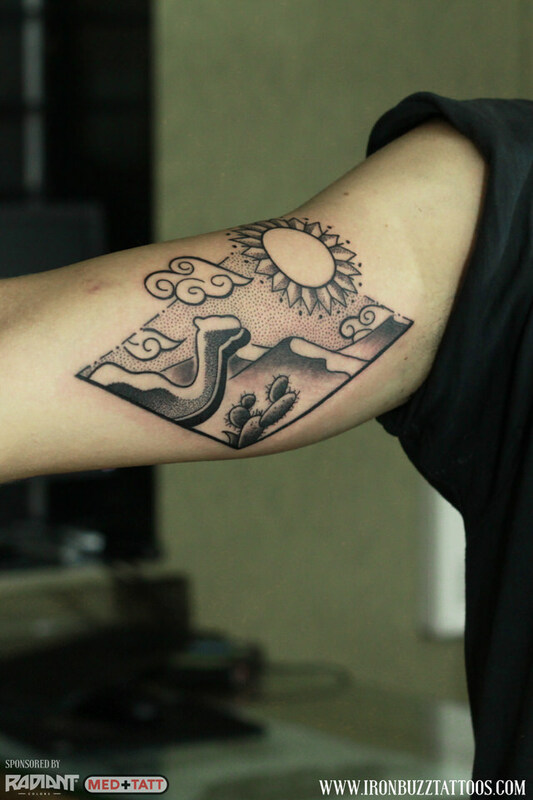 We are in awe with the placement and designing of this mountain inspired tattoo. 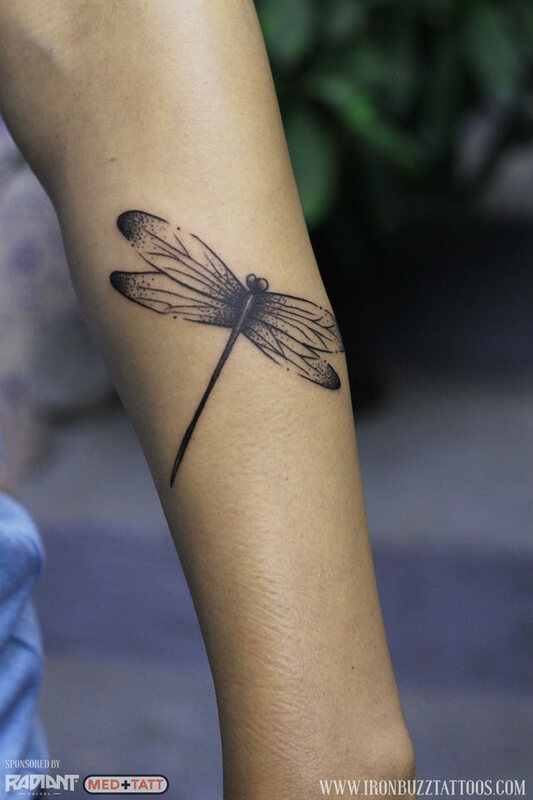 This is not the reason for her gorgeous dragonfly tattoo! Lines here! lines there! and voila! We have an arm band! You should get one too. The Hamsa Hand is an ancient Middle Eastern amulet symbolizing the Hand of God. This outstanding tattoo by Jayesh is one of the best Hamsa hand tattoos we've ever seen! Hatching is a linear drawing technique that is used to create detail, texture, tones and the illusion of form and light. 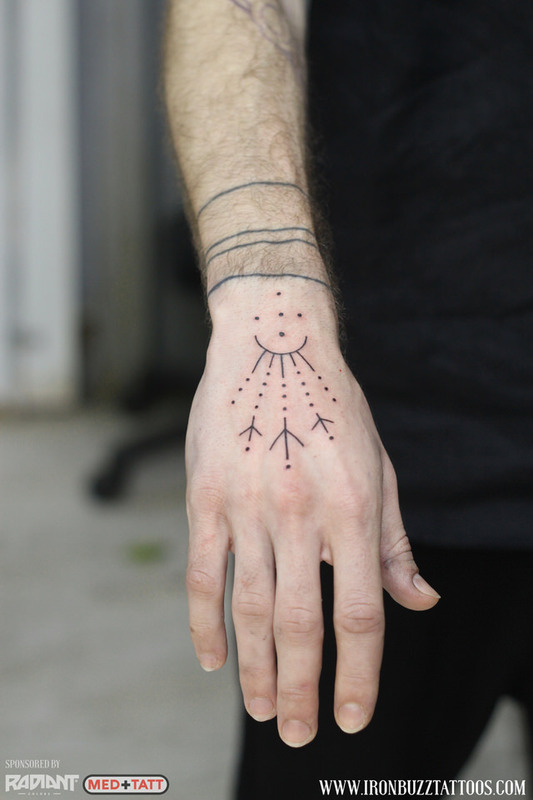 And clearly Jayesh has nailed all of those in this Hand Tattoo. Tibetan Om designs have always been our favourite but when you team it up with dots, you don't get anything else but a perfect tattoo! Oh...myyy......GOD! *deep sigh* That rose tattoo is gorgeous! Tomas Moucka, representing Inega Models and make-up artist for well-known actress Sunny Leone, got this Rabari tribe inspired tattoo! Harry Potter, Star Wars, Power Puff Girls, Batman, Simba and Tin Tin! Say WHATTT? Agni, the Hindu God of fire is regarded as the friend and protector of humanity. 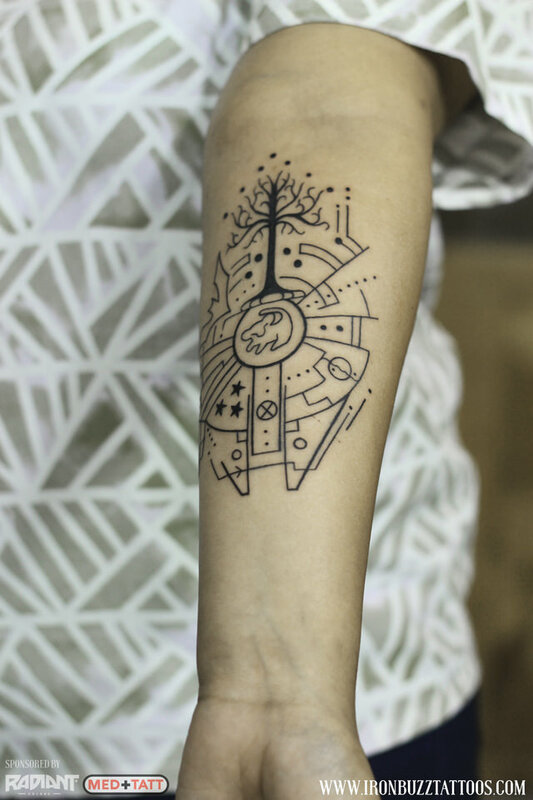 Jayesh created this Madhubani and Moghul art inspired tattoo that will always remain close to Sumanth's heart. Reference from one of Frederic Forest More's drawings and look at how beautifully Jayesh placed this minimalistic tattoo on our client keeping it's fragile composition in mind! The Hindu religion is rich with spiritual imagery and religious symbols. 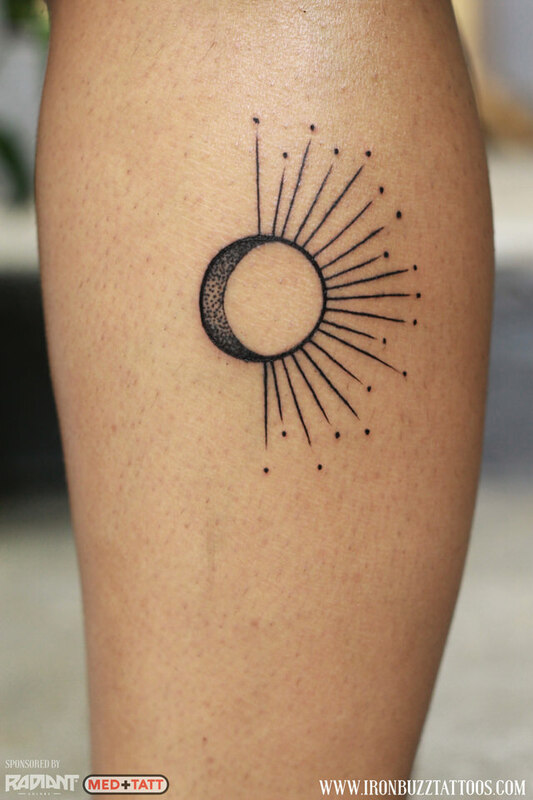 Some of the most common symbols in this religion are the Mandala (which represents the universe), and the Mehndi (the art of applying henna) style of tattooing. We at Iron Buzz are obsessed with perfecting these spiritual and ornamental tattoos. Don't we just love exploring nature, have a sleepover and just stare at billions of glowing dots in the night sky? This tattoo means just that! Ornamental Butterfly to keep you positive! ALWAYS! 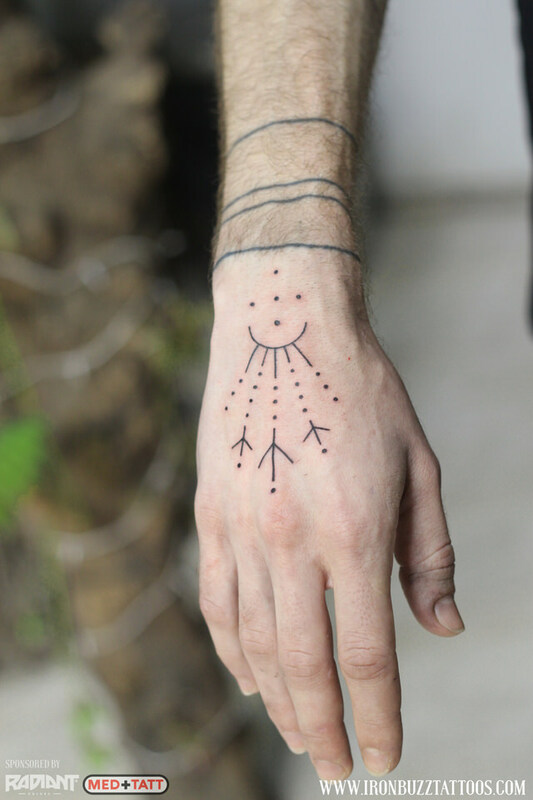 Last but not the least, this amazing nature inspired tattoo to always look forward for in life! Jayesh also does black and grey, colour, geometric, and neo-traditiional tattoos. His impeccable line work, symmetry and attention to detail make for timeless, artistic tattoos that stand the test of time.